Regular updates will be added here on the progress of our brand new Flagship Jaguar Showroom. We’re getting closer to a completed new showroom space, and we can’t wait to share it with you. Our workshop bays and valeting areas are all taking shape as the interior fittings continue to be installed and it won’t be long before furniture is moved into the showroom areas. The new customer lounge will provide the perfect space for you to relax, work or discuss your vehicle options with the team. For now, sit back, relax and watch the latest instalment of our new showroom progress. Work is progressing nicely with our new premises for Taggarts Jaguar at Hillington Park. Our signage has now been installed and the interior fittings are being worked on to provide features such as state-of-the-art lighting, so that you can experience our cars in perfect daylight conditions. There will also be generous new lounge areas and a barista bar to give you the perfect space to relax or work and to browse our accessories and merchandise. We’ll keep you posted on when you can explore the space for yourself…. Such a gorgeous day today and perfect weather to take an aerial view of our new development for Taggarts Jaguar at Hillington Park. Work is progressing nicely and we’re getting closer to our ‘house’ move. Check this page for the next progress update…. Our new development for Taggarts Jaguar at Hillington Park continues to take shape, both inside and out. 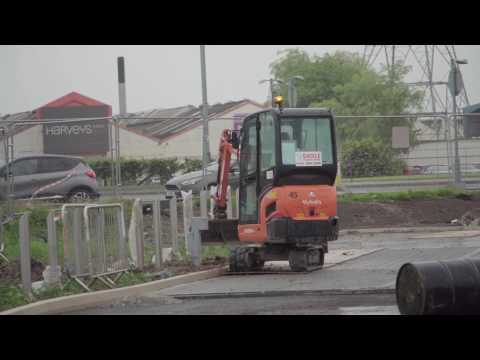 Our customer parking and vehicle display areas are being laid and landscaping underway. We can’t wait to see the next instalment. Keep watching this space for more information as it unfolds. Construction has began at our newly acquired 4.8-acre site at Hillington Park, Glasgow to create a new flagship Jaguar showroom close to the M8, alongside our new state-of-the-art Volvo showroom. With the grand opening due in mid-2017, the new facilities will create up to 100 jobs, and will be managed and operated by Lookers’ Taggarts Motor Group division in Scotland. “Glasgow and Scotland has long been part of Lookers’ success and we are delighted to make further significant investments which help to support our long-term growth in the region. The new Jaguar showroom space will complement the car brand’s exciting retail investment strategy plans which includes a programme of new-look stylish, clean-looking, ultra-modern dealerships which include comfortable lounge-style waiting areas with free wi-fi, alongside drive-in covered service departments. The new Jaguar retailer will also incorporate the introduction of the standout ‘ARCH’ retail concept design which is based on exceptional architectural innovation and which will set the iconic building apart in the area. With the customer journey at its heart, these re-imagined dealerships are warm, eye-catching and refined - and are designed to complement the brand perfectly.